BMW’s new X7 4×4 is packed with technology and luxury gadgets. BMW has revealed its new large seven-seater SUV, the X7. With a focus on space, luxury and technology the new BMW is set to take on the full-size Range Rover. 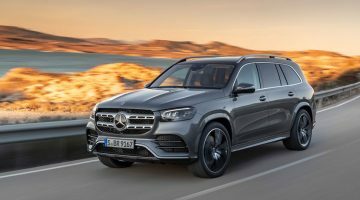 The BMW X7 follows on from a concept car launched at last year’s Frankfurt motor show that previewed BMW’s intention to make a big, premium SUV to sit above the X5. Some of the show car’s challenging looks have been toned down for the production version, but it still retains a similar bold aesthetic. The X7 will go on sale in Arpil next year and will cost from $95,075. At the front, the new X7 features the largest kidney grilles BMW has ever fitted to one of its a production cars – the BMW roundel is also much larger than usual so as not to be dwarfed by the massive grilles. Either side of the X7’s chromed nostrils is a pair of shallow LED lights with the part-hexagonal daytime running lights similar to other new cars in BMW’s range. The X7’s premium image is established by the use of chrome around the windows, in the front bumper and on a trim section that extends from the front wings, down the sills and into the rear bumper. There’s also a chrome bar between two rear lights, a detail that BMW has only ever used on the 7-series before. The X7’s look changes slightly depending on what trim level it is equipped with; the Design Pure Excellence trim is the most luxurious-looking with an aluminium grille, chrome accents and 21-inch Y-spoke wheels. Meanwhile, the M Sport trim is slightly tougher-looking with high-gloss black or black chrome accents, different side skirts and front and rear bumpers. 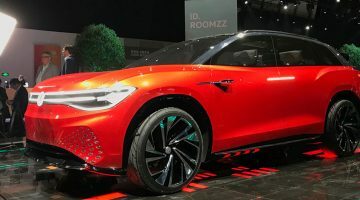 BMW’s Individual extra options also include a set of 22-inch wheels (the car comes on 20-inch wheels as standard) and a Sunstone metallic paint. From its launch, the X7 will be on offer in four different versions and a range of engines. There’s two straight-six diesels available, a 261bhp one in the xDrive30d while the M50d comes with 394bhp – they both come with AdBlue injection to control emissions. The X7 xDrive40i comes with a 335bhp straight-six petrol, but the other non-diesel version, a petrol V8 in the xDrive50i won’t be available in Europe. Every version of the X7, no matter what engine you choose, comes with BMW’s Steptronic gearbox, an eight-speed automatic transmission. Drive is then sent to all four wheels, however – like BMW’s other four-wheel drive systems – it predominantly sends torque to the rear, only driving the front wheels when extra traction is necessary. The sportiest model, the M50d, gets BMW’s rear M Sport diff (an electrically controlled limited-slip differential) and, although it will undoubtedly have some effect on the X7’s on-road abilities, it’s useful when using the car on rough or slippery ground and also comes as part of the off-road package for the xDrive50i. This off-road package includes under trays, an extra button on inside to let you select between four different off-road driving modes (Snow, Sand, Gravel and Rocks) and a display within the centre screen that shows what the car is doing. The X7’s front suspension is a double-wishbone setup while the rear is a multi-link configuration with the ability for the back wheels to steer. The four wheel steering does add stability at high speeds, but its greatest benefit is making the large SUV more maneuverable – the X7 is over 5 metres long and 2 metres wide with a wheelbase of 3.1 metres. As standard, the X7 has air springs at all four corners that allow the X7 to run at different ride heights for various situations. 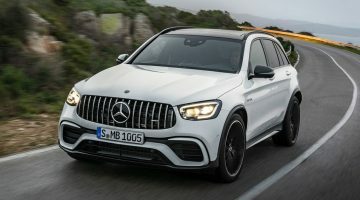 It can raise 40mm higher than standard for off-road driving, lower the same amount when stationary for loading or, it lowers by 20mm when driving above 138kph. The air suspension control is incorporated into the car’s electronic stability system too so can compensate for additional load at front when braking. Roll can also be controlled with optional electromechanical anti-roll bars. As one of BMW’s most premium cars, the X7 features all-new switchgear with a gear selector, an iDrive dial, and parking brake button not on any other BMW. There’s also a 12.3-inch fully digital instrument cluster. The luxury and technology isn’t limited to the front occupants, passengers in the middle and third row of the X7’s seats also get a share of the entertainment. There are three available sound systems in the X7, the standard version has 10 speakers dotted around the interior while the top spec system has 20. All three rows of seats are heated and have electric adjustment, while all of the rear seats can fold down and then back up electrically. There’s four-zone air con as standard, but five-zone (an extra one for the very back section) is available as an option. The other options available are cup holders that can keep drinks either warm or cool, 10.2-inch screens embedded into the back of front seats, a Blu-Ray player, two USB ports, an HDMI socket and a headphone jack. And, if only six seats are needed, the middle bench can be replaced by two individual seats that have a gap between them for easier access to the rear. The most significant element that all passengers can share is the large panoramic glass roof that extends right to the rear-most seats. Then, in the dark, LED lights shine across the inside surface of the glass roof that’s then reflected by over 15,000 patterns in the roof designed to look like stars. The colour of these lights can also be changed. The X7 comes with a suite of driver assistance systems such as radar cruise control, lane assist, automatic parking and an interior camera that monitors the driver’s head and can detect if they fall asleep so the car can alert them and wake them up. It also has Reversing Assistant that, should the driver take the X7 down a particularly tight road or parking space that’s tricky to reverse out of, will allow the BMW to retrace its path without the driver needed to use the steering wheel, just the accelerator and brake.